Since the American Dental Association started their oral health awareness campaign as a one-day event in 1941, it has grown to a nationally recognized month-long effort to spread awareness and information about the benefits of proper oral health for children. Each year, communities learn about oral health through health fairs, poster displays, essay contests, free dental screenings, presentations in classrooms and more. Below you will find ways to engage in your community along with us. Choose how you’ll help spread oral health awareness, then share your story with the hashtag #TeethRule so we can share it to inspire others! #1: Host a Smile Drive! Our Smile Drive is a great way to give back to and educate your community about the oral health crisis in America during National Children's Oral Health Month and throughout the year! For many struggling families, oral care products are a luxury they simply cannot afford. Collect toothbrushes, toothpaste, floss, rinse, and mouth guards and donate to an organization that benefits at-risk kids in your community. Since 2014, our awesome Smile Drive volunteers have distributed 1,861,924 oral care products to families in need.Help us reach 2 million in 2019! Visit our Smile Drive page for fun contests and how to register. #2: Register to Be an Oral Health Action HERO! Childhood tooth decay is Public Health Enemy #1 in America! In order to stop decay, we must triumph over three barriers: beliefs, behaviors, and environmental influences. Each community has its own unique challenges when it comes to good oral health. Our Health Education Resources and Outreach Program (HERO) works to identify and address those specific issues at a local level. 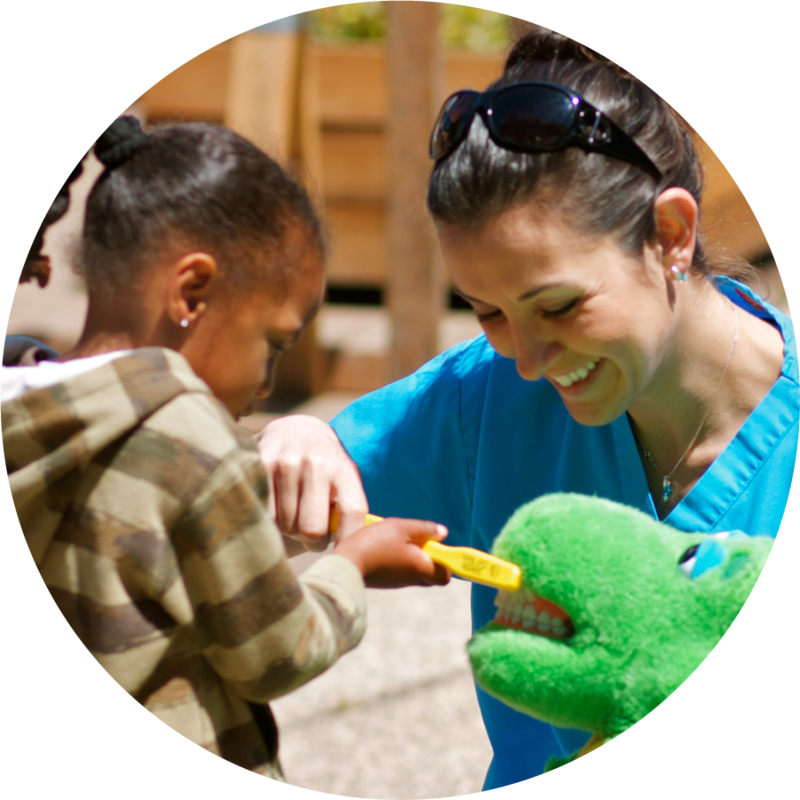 Our local Oral Health Action Heroes are essential to the success of our education programs nationwide. To make an impact in all of our nation’s communities we need heroes to step up and take action! Will YOU join the fight? Learn more on our HERO webpage. Simply need fun activities to educate kids about oral health? Find resources here. Throughout the month of February, we will be sharing oral health facts, tips, and resources to spread awareness of the need for oral health education, preventive services and access to care for children across the nation. You can help by following us on Facebook, Twitter, Instagram, or LinkedIn to share our posts with your friends and colleagues. Subscribe to our monthly newsletter and share it with your friends! #4: Give to In the Gap. Did you know that America's ToothFairy helps pay for care for kids who require services that cost more than their family can afford? Thanks to generous donations, our In the Gap Program can provide grants for patients of our partner clinics who need services such as extensive restorative care, specialized services, dental appliances, anesthesia and more. National Children's Dental Health Month is a great time to help support this wonderful program. 100% of your tax-deductible donation will go directly to fund the care of a child in need. To give, click here and select "Urgent Dental Services for a Child". #5: Volunteer at one of our partner clinics. Our nonprofit Dental Resource Program clinics sometimes need a helping hand from community volunteers. Find one near you and inquire about ways you can help or check the list of opportunities at the end of this post, below. Find a list of clinics with links to their websites here. #6: Join us for Celebration of Smiles, Chicago! Are you planning to attend the Chicago Dental Society's MidWinter meeting or live in the Chicago area? Join us for an elegant evening as we celebrate you, our loyal supporters and volunteers, for making it possible to impact the lives of more than 800,000 children and their caregivers last year! This celebration is free and will be held on Thursday, February 21st. Click here for more details or RSVP to rsvp@ncohf.org by February 15th. #7: Every Purchase Brings a Smile. Throughout National Children's Dental Health Month, stock your dental office with GC America products from PureLife Dental. A portion of the proceeds will benefit our Smile Drive Program. This promotion starts on February 1st. Visit PureLifeDental.com to place your order. We are grateful for our sponsors who generously donate a percentage of proceeds from the sale of products to help support our mission. For a full list click here. Finally, we hope you will consider supporting our mission with your donation. Click the “donate” button on our website to provide access to care and oral health education to underserved children across the nation. Thank you for helping America’sToothFairy save smiles! Owantonna - Promote oral health and how it effects overall health with age appropriate classroom presentations. The range is preschool, kindergarten, 1st grade, 5th grade, and high school. Let's Smile has 21 classrooms already scheduled. You may have your choice of age range and dates already scheduled. Saint Paul - Hope Dental Clinic is seeking dental professionals (dentists, hygienists, assistants, and dental students) to volunteer at their clinic. This is a great opportunity to contribute your skills to those most in need and become a part of their volunteer family, which includes almost 70 dentists and hundreds of other students and professionals. Volunteering at one of their Give Kids a Smile or St. Paul Dental Connect treatment events is a great place to get started, which happen eight times per year. The next Give Kids a Smile event is on February 8-9 from 9am-4pm. Volunteers can also help out during the week day hours (M-TH 8am - 5pm or 6pm - 9pm). They will work with you to make a schedule that fits your needs. Kansas City - Cass Community Health Foundation is coordinating school-based oral health programs for approximately 2,500 students throughout Cass County, Missouri & Grandview, Missouri, during February in honor of NationalChildren's Dental Health month! Volunteer dentists and dental hygienists are needed to screen children for oral disease. Dental assistants can help provide oral health education and apply fluoride varnish treatments. Non-dental volunteers are needed to help with paperwork, data entry, and maintaining student flow during the event. There are several dates, times and locations to choose from. Help bring smiles to area students! Click here sign-up.